Ok, so I'm a total geek and even I think is a ridiculous waste of money. 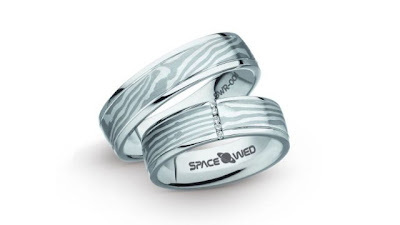 There is a company called Space Wed that is selling wedding bands make of "space gold!" Now, if it were gold discovered on some distant exoplanet, or mined from a passing comet, that would be pretty cool. Their "space gold" is just regular old Earth gold shot up in a sub-orbital flight for about 15 minutes. The rings go for $17,000 per pair and they will only be making 50 pairs total. I suppose that's somewhat fair since it's going to be such a limited production, but if I were going to spend that kind of money on wedding rings I'd put the cash into the diamond and save up to send myself into space! If you'd like to get your hands on some "space gold," check out the link below. So VERY excited to announce that Skip Kelly Productions has been named the official Music Director and DJ for this year's Jacksonville Fashion Week! I'll be working with all the designers to craft the perfect runway soundtrack for their show, as well as planning all the music for the parties and events both before and after! Best of all, I'll be there spinning live alongside the runway as it happens! I was able to go to one night of Jacksonville Fashion Week last year and was really impressed. Jacksonville absolutely needs more events like this. From what I hear, (but can't tell) this year's event is going be much bigger and even more dazzling! That's not even blog-hype, the things they are planning and even the venue are going to be top-notch. I'm honored and truly thrilled to be involved this year!